← Did Any of Our Ancestors Own Slaves? William King and Dorothy Hayne are the 10th great-grandparents of Richard, James, Gary, Lisa, Carl, Jane, Bruce, Cathy, Ron, Stacey, Matt and Sandy; and 11th great-grandparents of Asher, Owen, Caitlyn, Becky, Emily, Jack, Jill, Jordan, Mike and Brian. William King is believed to have been born in England in 1595. His parentage is unconfirmed, although he may have been the son of William King (1565-1625) and Ann Bowditch (1573-c1625) of Weymouth, Dorset. William married Dorothy Hayne in Sherbourne Abbey Church of Saint Mary in Sherbourne, Dorset, on February 17, 1617. 60. William Kinge, aged 40 years. 61. Dorothy, his wife, aged 34 years. 62. Mary Kinge, his daughter, aged 12 years. 63. Katheryne Kinge, his daughter, aged 10 years. 64. William Kinge, his son, aged 8 years. 65. Hanna Kinge, his daughter, aged 6 years. Another child, Samuel, who would have been two in 1635, is absent from this list, but appears later in Salem. William and Dorothy had three additional children in Salem: Mehitable (1636), John (1638) and Deliverance (1641). William was a member of the First Church at Salem but joined the Antinomians in 1637. Antinomianism literally means being “against or opposed to the law”, and was a term used by critics of those Massachusetts colonists who advocated the preaching of “free grace” (i.e. the belief that divine grace, and not earthly deeds, is the only means to salvation) as opposed to “legal” preaching. Antinomians were also called Anabaptists and Familists, and were considered seriously heretic in early New England. William was ordered by the authorities in Salem to sever his connections with the Antinomians but he refused and was forced to surrender his gun. 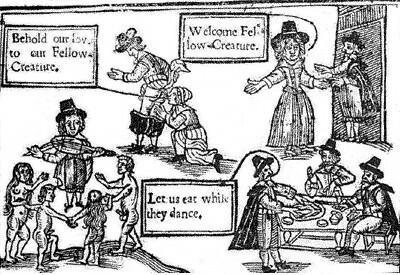 These Antinomians are scathingly depicted by a contemporary Puritan critic as engaging in such “sinful” acts as enjoying food and music, dancing naked and “loving” one another’s buttocks. Sometime later William was banished temporarily from Salem for sheltering persecuted Quakers. One of William and Dorothy’s children, Katherine, married a staunch Quaker, John Swezey. William died in 1650 in Salem, after which his widow and children left Salem for the more religiously tolerant Southold, Long Island. Dorothy died at Southold in 1684. Curiously, not one but two of William and Dorothy’s daughters are our direct ancestors. Hannah (1629-1688), who married Richard Brown (c1629-c1687) in Salem in 1650, is 9th great-grandmother to Richard, et al. Deliverance (1641-1689), who married John Tuthill (1635-1717) in Southold in 1657, is another 9th great-grandmother. Hannah’s and Richard’s granddaughter, Elizabeth Brown, married her first cousin, John Tuthill, grandson of Deliverance and John, in 1707. Another of Deliverance’s and John’s children, Henry, would become the great-grandfather of Anna Tuthill Symmes, First Lady of the United States and wife of President William Henry Harrison. Anna’s grandson, Benjamin, also became President of the United States. One of Hannah’s and Richard’s children, Hannah, would become the 4th great-grandmother of President Warren Harding. Not to be outdone by his siblings, John King, brother to Hannah and Deliverance, is the 5th great-grandfather of President William Howard Taft.